URBED have worked for almost 10 years with Bury Council on the regeneration of Bury Town Centre. This was recognised in 2011 with an RTPI Planning achievement award won jointly by Bury Council and URBED. Our first town centre masterplan completed in 2003 was called 'Bury but Better'. This was inspired by the answer to a question at one of the consultations - what should Bury be like in the future? It reflected the strong attachment that people have to the town but also the fact that the town centre (with the exception of the market which is the biggest in the north) wasn't doing as well as it might. Through the initial work we identified a number of major opportunities to develop the town centre, to expand its shopping offer, to provide new offices, business space and town centre facilities and also to attact new housing. This led to the development of the Rock Shopping Centre, initially by Thornfield, completed by Hammerson. The Townside Field site was also developed by a JV between the Council and Ask to create new council offices, a health centre and a hotel. North of the town centre the council has created the Chamberhall business park to attarct inward investment and jobs that would otherwise go to out-of-town locations. 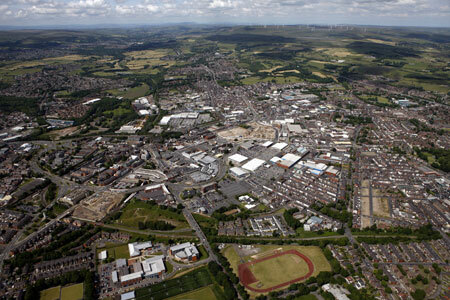 In June 2008 URBED were reappointed by Bury Council to work on an update of the 2003 Masterplan. At a point when the Rock, Townside and Chamberhall sites were on site the time was right to look at the next set of opportunities. 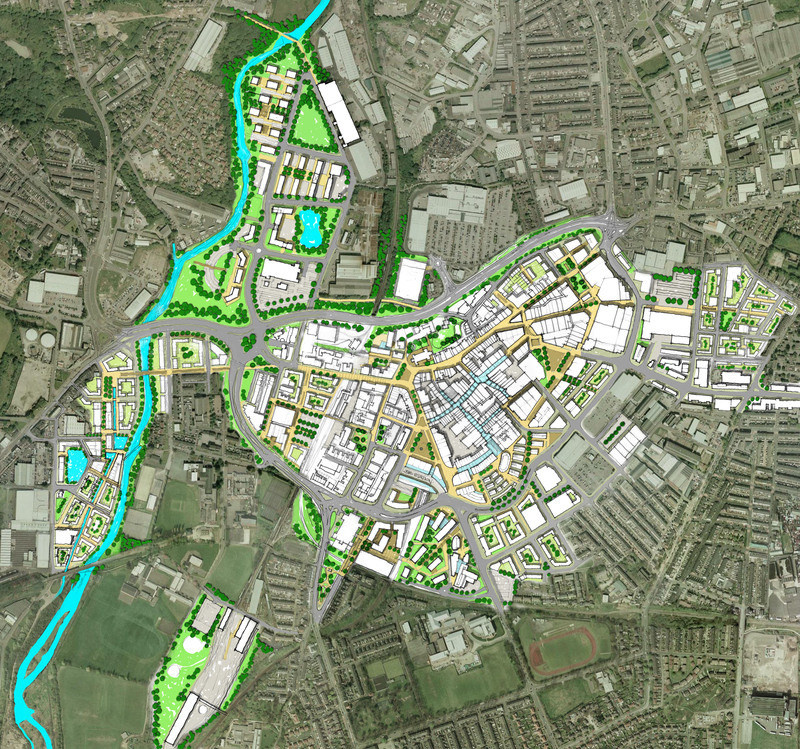 The updated masterplan is based on seven quarters for which detailed projects and proposals have been developed. The strategy has fed into the Bury Local Development Framework and takes Bury Town Centre onto the next stage in its continuing growth and development. Things have obviously been quiet in the last few years but in 2012 Hammersons have started work on the final stage of the Rock. Bury is a small council and has not traditionally had access to regeneration funds. They have a small but very committed and effective group of officers who have used their limited resources (mainly land ownership) to bring about the sort of change that most towns of this size can only dream of. Hamersons have announced the final stage of the Rock development which is really good news. 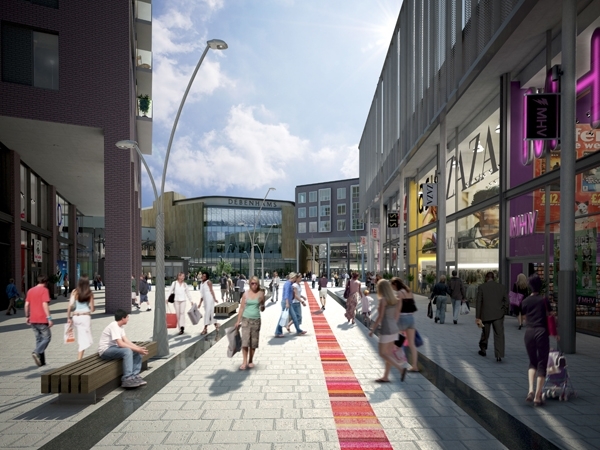 The scheme will include a number of restaurants and illustrates the success of the new shopping centre. BDP's masterplan for the development included a strong diagonal route to create a clear pedestrian link back into the town centre. URBED worked with the council on a number of studies to explore how this crucial part of the scheme could work - so that the Rock would enhance the whole centre rather than diverting its trade. The development announced is the link between the new scheme and the main part of the centre and so is the last bit of the jigsaw.